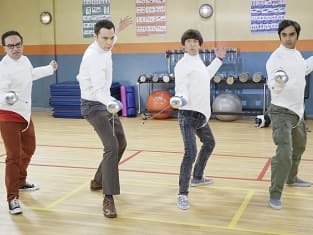 Kripke: In fencing, we don't call it a stab. We call it a touch. Sheldon: Yes, I'm aware. But if I say I want to touch one of my friends, I'll get called into human resources. Kripke: Before we start, I just want to warn you fencing isn't a joke. I hope you're not here because you think it's going to be like Star Wars. Leonard: That's not why we're here. Raj: Yeah, I'm here because I think it's going to be like Game of Thrones. Permalink: Yeah, I'm here because I think it's going to be like Game of Thrones.